Get Yourself Organized With Webjets! As an educator and the mother of a child with special needs, I never fully understood the value of visual learning. A number of years after I started teaching elementary school, I revamped my instructional materials and saw the positive impact that visual learning had on my students' retention of content. Studies have shown that we rely heavily on our senses to process information when learning, and engaging more than one sense when teaching can help information processing. Using multiple senses allows more cognitive connections and associations to be made with a concept. According to the Association for Talent Development, multisensory learning can improve employee's retention of information. The FREE* cloud-based tool Webjets is great for visual learning, and also will benefit anyone who is looking to organize his/her knowledge and thoughts. Too often when conducting research or surfing the web, I have countless browser tabs open, many of them with important information. The problem is that they are just too distracting and cause me to lose focus on my tasks. Enter Webjets.io. So what exactly is Webjets.io? Webjets is your very own adaptable desktop that you can customize to meet your very own needs. It allows you to collect and manage any kind of information from the web using cards. These can be used for creating bookmarks, mind maps, moodboards, documents, tables, interactive presentations, and more. Write notes and note ideas. Set goals and remember tasks. No matter if it's YouTube, Wikipedia or Instagram - drag anything into Webjets. So how does Webjets work? Use drag and drop from your web browser's address bar, a bookmarklet, or even IFTTT to push your data into Webjets. 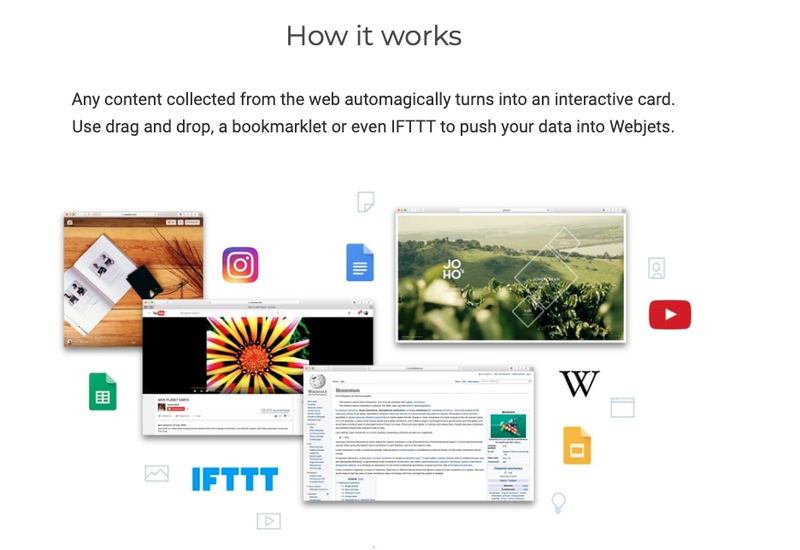 Any content collected from the web automagically turns into an interactive card. Webjets allows you to manage any kind of information with ease. Place cards freely, or group them at the speed of thought. Are you or your students conducting research? Webjets can be an invaluable tool in so many ways. First of all, you can use Webjets to keep track of all your sources (websites) for your bibliography by managing bookmarks in a fun and visual way. Second, you can use Webjets to brainstorm information by creating a mindmap. You will be organizing your information in a visual and relaxing way as you structure the information in the way that you think. As you add more information to the Webjets desktop, your board will expand. You will be able to keep all of your information in one place. Third, when doing a research project, it's a process that requires a number of tasks. Webjets allows you to manage your tasks by organizing them in a visual way, helping you stay focused and productive. You can organize clusters of information using lists, which are the most simple type of presentation. Use tables to make Kanban boards or visualize two-dimensional structures. Webjets allows visual collaboration, enabling you to be more effective by applying visual thinking, like color-coding, pattern recognition, or clustering techniques. It does the job the way you want it to be done. You will allow your students to curate content by enabling them to learn the way that they think. A hot topic in today's world of education is collaboration; individuals work together as a team in order to accomplish a goal. Each member of the team is responsible for a different task to complete. Webjets allows you to collaborate better by sharing learning materials - or anything for that matter - with your friends or teammates, and enjoy all your changes instantly synchronized between users. Set due dates to manage your team's workflow. The only way that one can improve his skill of teamwork is by working together with others on an assignment. This cannot be taught; rather it needs to be modeled and practiced hands on. Speaking of synchronization, it's important that the apps and/or tools that we use in and out of the classroom are "device agnostic," which means they will be compatible with any device; whether it's a computer, tablet, or phone. Webjets will work on any device, as long as there is an active Internet connection. When you login to Webjets, you will see all changes synchronized between your devices, providing consistent access to your own digital environment from anywhere in the world. by allowing them to engage and interact with your presentation. Take into account what your students' needs are and choose the best presentation to collect your information. Structure and present your libraries of knowledge with countless different ways. Invent your own approach to productivity on top of your favorite web services, such as YouTube or Google Docs. When our students are curating digital content, we want them to be proud of themselves and allow them to publish their content online in order to share with others. With Webjets you can publish anything ranging from a simple note to advanced research efforts. You can share it on your favorite social network and let your friends admire your thoughtful work. Webjets is continuing to add new features. One upcoming feature is the "Search" feature. You will be able to get instant results from your data inside Webjets or any other connected web services using Webjets' powerful search engine. I am looking forward to seeing this implemented. I am so happy that I have learned about Webjets. I have already shared it with teachers and they were amazed by what they are able to do using the tool. I am looking forward to seeing the products that they and their students create! Click here to learn more about Webjets.io. *Education plans are free for people in education or non-profit organizations. eMaze your audience! It's PowerPoint + Prezi + Google Slides on Steroids! I was fortunate several months ago to learn about emaze, a powerful FREE* tool that can be used in the classroom. Initially, I thought that it was merely a presentation tool, but in all actuality, it's so much more. Not only can you create amazing presentations in minutes, but you can also use emaze to create websites, e-cards, blogs, photo albums, and more. Teachers can engage their class with interactive presentations that make learning more accessible, stimulating, and effective. In fact, I know of an eighth grade class that is using emaze to create its own digital yearbook! So you ask, "A presentation tool? Why do I need ANOTHER presentation tool? I have Microsoft PowerPoint, Prezi, Google Slides, etc. Isn't that enough?" But that's just it. Emaze is not just another presentation tool; it's much more powerful than the presentation tools listed above. Think of emaze as Microsoft PowerPoint + Prezi + Google Slides together on steroids. And THAT is what emaze is all about. 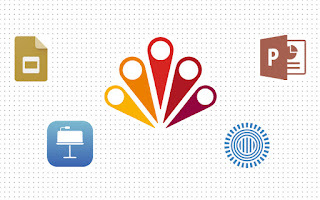 Click the link below to learn how emaze compares to other presentation tools. Creating beautiful content in emaze is very easy as the interface is user-friendly. There are many templates using various themes available on the website. Make your presentation stand out of this world with designs, gorgeous animations and 3D and video effects. In addition, there are many finished projects created by educators that are readily available for duplication and each user can edit it to his/her liking. The possibilities are endless. And if you ask, "But I created something in Microsoft PowerPoint already.... I don't want to reinvent the wheel. What do I do?" Great question! You can import PowerPoint files directly into emaze and with very little effort. 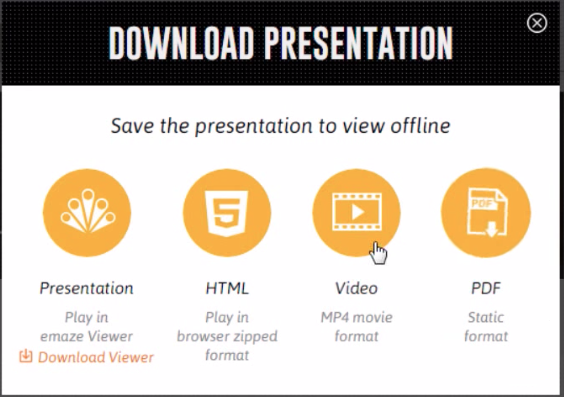 And if you created a Google Slides presentation, all you need to do is download and save the Google Slides file as a PowerPoint (.ppt) file and then import that file directly into eMaze. It's that simple! You can add video by uploading the file from your computer and/or mobile device. Another option is you can add the video's link on YouTube. In my experience, I have found that the video playback was better after I uploaded the file directly from my computer. Audio files work the same way; they can be uploaded or you can provide the link from YouTube. Emaze is a device agnostic, cloud based tool. It can be used on all devices and in all places, as long as there is a high speed internet connection. Work and continue presentation projects at school, home, and on-the-go from laptops, tablets, and even mobile phones. Emaze is currently optimizing its software to be fully compatible with iPhones and smartphones. Personally, I feel that content creation is easier on a computer than on a mobile device. 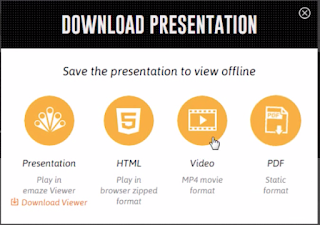 Projects can be downloaded in order to present offline in a variety of file formats, including but not limited to: .pdf, .mp4, and .html. It is very easy to share presentations (and other projects) with students, teachers, and everyone else by email, Facebook, Twitter, websites, and blogs. Looking for ways to collaborate? More than one person can edit the same presentation or project file. However, the current setting for FREE and EDU (Premium) users is that ONLY ONE user can edit a file at a time. The collaboration feature is only available for business member accounts at this time. I have mentioned to emaze staff the importance of educators and students being able to collaborate on the same project simultaneously. I hope that they will add the collaboration feature for EDU users in the near future. You can learn more about emaze by taking a gallery walk through the following presentation. (The video within the presentation can be accessed directly at https://www.youtube.com/watch?v=I-9nHq9ld6Q&feature=youtu.be. Have fun creating your "emaze-ing" projects and hoping to see them on the emaze Explore page soon! The default setting at Emaze is that presentations and other content which one creates is public. 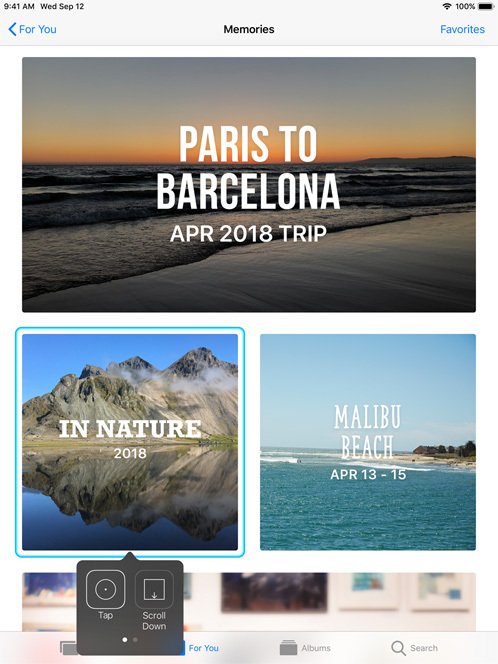 These public creations are open for the emaze staff to choose for the Explore page, where they feature a constantly rotating variety of real projects made by their user community. If your presentation is chosen to be on the Explore page, you will receive a notification email from us and you can decide whether you want to keep it on the Explore page or have it removed. Premium users do have the option of making their presentations private. To find out more about how to make your presentation private, please click here. If you have additional questions about how emaze works, please visit the Emaze Support page. *A premium version is available through a paid subscription. As a mother of a child with special needs (PDD-NOS and high functioning autism spectrum disorder) and as an early childhood educator, I have spent nearly a decade reviewing apps. When considering Educational Technology, it's important to choose tools that enable the learner to become independent in his/her learning and lead him/her to show mastery of a specific skill. I am not only referring to academics; I am also referring to social, emotional, self-help, and adaptive learning as many of these are challenges for children who are developmentally delayed. The technology needs to be flexible, student centered, relevant, and presents the learner with the opportunity to choose what he/she wants to do. Most importantly, the technology needs to be used in a constructive way as opposed to merely being a babysitter. Technology should be used as a "means to an end" and not an end in itself. The learner should be focused on the content and skills being taught, rather than the technology itself. The goal is that the learner should be able to demonstrate the skills WITHOUT technology; technology should help the learner to reach that point. I recently had the opportunity to review Bluebee Pals, developed by Laura Jiencke of Kayle Concepts, and found that it is definitely a tool that meets the criteria above. 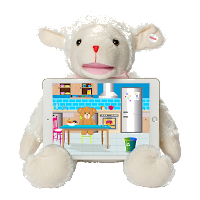 Designed for children ages 3-7 as well as those with special needs, the Bluebee Pal is an interactive plush learning tool with a FREE companion life skills/educational app. Using Bluetooth, it connects to all iOS and Android Devices and pairs with all apps with a narrative. 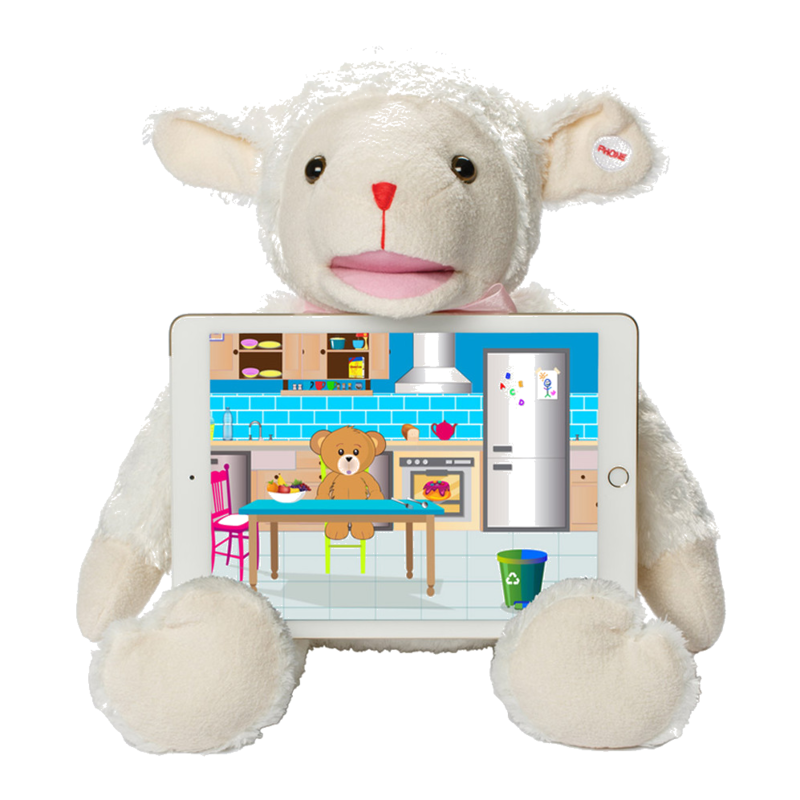 Its patented technology allows Bluebee’s “mouth and head” to move while reading stories, teaching through educational games, learning a language, and singing songs. What sets Bluebee Pals aside from other children's learning apps? First of all, a stuffed animal is included as part of the learning. There are six different Bluebee Pals to choose from. This is great for those children who crave physical stimulation and sensory input. I don't know of any preschool child who doesn't enjoy the company of his/her own stuffed animal. For example, Second Step, an early childhood curriculum that teaches social and emotional learning, features the use of stuffed animals. 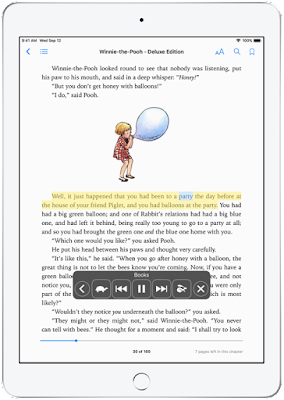 Second, the ability to use the stuffed animal when reading a story enables the learner to listen to the narrative alone and pay attention to the Bluebee Pal, instead of watching the screen on the device. We know children learn best when it's done in a way that is multi-sensory; the more senses that are stimulated, the greater the chance that the children will grasp the material. However, it is also important that children strengthen individual senses when learning as they will not always have the option to experience multi-sensory learning. This is also a good idea when wanting a child to hear a story without giving him/her additional screen time. Adults can assess the child's comprehension and listening skills by asking questions after the Bluebee Pal narrates the story to the child. Children with special needs benefit from apps that are flexible and those that afford them the ability to make choices. They need to feel in control of their learning. Many of the activities in the Bluebee Pals app are designed with that purpose in mind. For example, when the child first opens the Bluebee Pals app, he/she is given the opportunity to choose one of six Bluebee Pals to learn with. The next step is for the child to select his/her favorite color of balloon, category, and the room of the house that he/she wants to explore. As there is no sequential order in which the child must complete a given activity, the child can choose the order in which he/she completes the given activity. In addition, the child can easily choose to repeat that activity without feeling that he/she must move onto another activity. A common goal for for younger learners and those with special needs is the ability to follow one and two step directions. For those who have difficulty with the reception of language, the Bluebee Pals app includes activities that can help them in this area of language and communication. Examples include but are not limited to: feeding the Bluebee Pal, brushing its teeth, and putting it to sleep. This is a great activity which can be integrated within a child's speech and language therapy sessions. Lily the Lamb gets ready for bed. Developmental delays in language often affect one's literacy skills in a variety of areas, such as comprehension, vocabulary, and phonics. 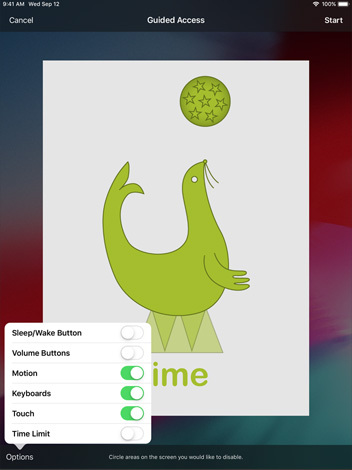 To strengthen the child's vocabulary skills, the app includes a sound-board feature where the child touches an object on the screen and the app identifies what the object is. Adults can practice these words with children by using them part of daily conversation when participating in these routines. To strengthen comprehension skills, the Bluebee Pals' app includes a number of mini-games that target inferencing and critical thinking skills. The child is given a specific situation must infer what the character must do within that context. Last but not least, the Bluebee Pal app includes a number of games that focus on phonics and letters in an interactive and engaging way. When choosing digital media, the content and skills that are being taught need to be relevant to the child's life. The Bluebee Pals app incorporates various daily living skills, such as hygiene, cooking, and cleaning up. The end goal is that the child will apply these skills to his/her own life. Needless to say, there is a greater chance that the child will do so when an adult is supervising the child using the app and reinforces the desired behavior each day. I am very impressed with Bluebee Pals and all that it has to offer. With all of the activities that were created to strengthen children's development in all areas of learning, it's a win-win. And the fact that the developers are open to listening to suggestions on ways to constantly improve it is invaluable. Looking for a gift for a preschool child or a child with special needs? A Bluebee Pal just might be the answer. It's no surprise that it has been the recipient of various awards. You can learn more about Bluebee Pals by visiting https://www.bluebeepals.com/apps-bluebee-pals/. 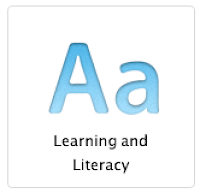 Are You Taking Advantage of Apple's iOS Accessibility Features To Promote Student Learning? 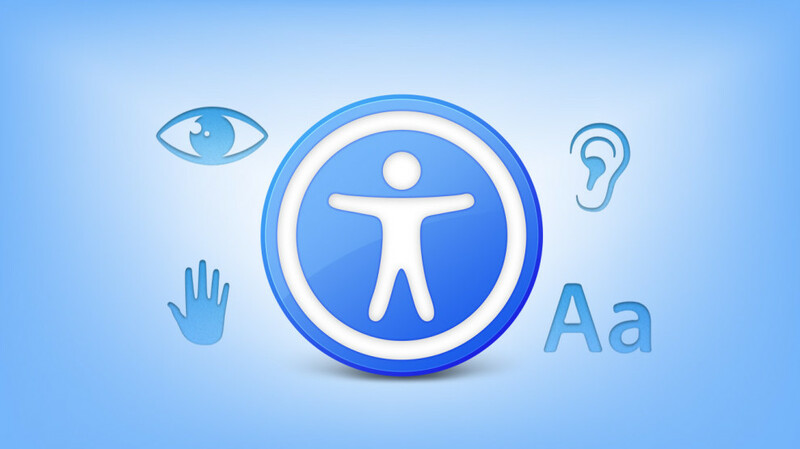 Apple has included a variety of powerful assistive features that are built into the iPad itself to complement one's vision, hearing, motor skills, learning, and literacy. I am sharing some of these features below. All of this information has been gathered from Apple's website. Technology is constantly changing and improving with each iOS update. Apple offers free sessions at many of its stores on the topic of Accessibility and how its technology can play a beneficial role in one's life, especially those with special needs. To learn more, visit https://www.apple.com/today/. You will need to change your location and search for sessions that focus on "Accessibility." You can also call your local Apple Store and ask to speak to the manager to inquire about setting up a session. Further, Apple has a 24/7 Accessibility Hotline where one can receive free support for Accessibility Features. That number is 1-877-204-3930. You can find some resources that include an iPad User Guide with Accessibility Features by visiting https://support.apple.com/accessibility/iphone-ipad. 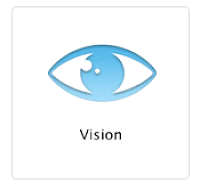 To accommodate users in the area of vision, Apple has built-in features that include but are not limited to: VoiceOver, Audio Descriptions, Display Accommodations, Zoom, Font Adjustments, Magnifier, Speak Screen, and Dictation. 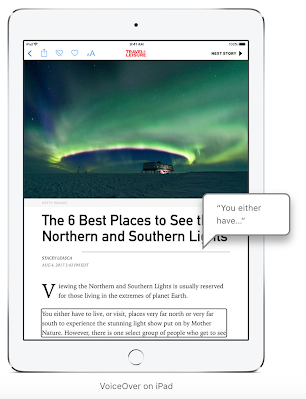 The Speak Screen feature can be used to read one's email, iMessages, web pages, and books if one has a hard time reading the text on the iPad. Turn on Speak Screen and swipe down from the top of the screen with two fingers, or just tell Siri to Speak Screen and have all the content on the page read back to you. You can adjust the voice’s dialect and speaking rate, and have words, sentences, or words within sentences highlighted as they’re being read. To learn more in detail about the various features that Apple offers to complement one's vision, visit https://www.apple.com/accessibility/ipad/vision/. In iOS 12, Apple has included features to complement hearing to support various apps/tools on the iPad. For instance, one can actually ask Siri a question by using the onscreen keyboard to ask questions, set up reminders, issue commands, and more. 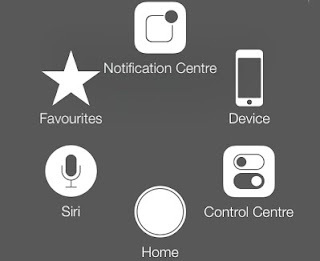 This option is called "Type to Siri" and can be found in the Accessibility area of the Settings. Apple has worked with top manufacturers to create hearing aids and sound processors designed specifically for iPhone and iPad. These advanced hearing devices provide outstanding sound quality, offer many helpful features, and are as easy to set up and use as any other Bluetooth device. 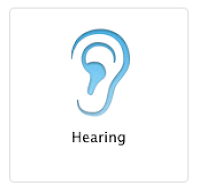 You can quickly access the features and settings of your paired hearing device by triple-clicking the Home button. Glance at the battery status or change the left and right volume, together or separately. And quickly apply your audiologist’s environmental presets as you go outdoors or enter noisy locations, like restaurants, without having to rely on additional remotes. 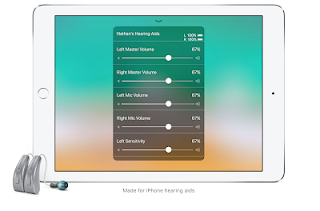 Additional information on Apple Accessibility features for Hearing can be found by visiting https://www.apple.com/accessibility/ipad/hearing/. The iPad is remarkably intuitive and easy to use. AssistiveTouch lets you adapt the Multi-Touch screen to your physical needs. So if you need to change some gestures, like pinch, you can make them accessible with just a tap of a finger. You can create your own gestures and even customize the layout of the Assistive Touch menu. And if you want an alternative to pressing the Home button, you can activate it with an onscreen tap. So if your iPad Home button is not working, this features comes in extremely handy! Gestures like rotate and shake are available even when your iPad is mounted on a wheelchair. And iOS devices support a number of third-party assistive devices that help you interact with your iPhone, iPad, and iPod touch. 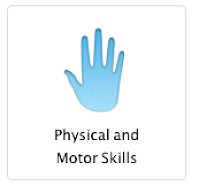 You can learn about additional features in the area of Physical and Motor Skills by visiting https://www.apple.com/accessibility/ipad/physical-and-motor-skills/. The more senses that students use to learn new concepts and skills, there is a greater chance that they will process the material and be able to retain it at a deeper level. If you learn better when you can hear what you’re reading or writing, features like Speak Screen, Speak Selection, Typing Feedback, and Predictive Text can help by adding an auditory component to text. Turn on Speak Screen and swipe down from the top of the screen with two fingers, or just tell Siri to Speak Screen, to have all the content on pages read back to you. Or use Speak Selection to highlight the specific range of text you want to hear, in colors that you can customize. Then follow along as highlighted words, sentences, or words within each sentence are read aloud. And with Typing Feedback activated, each letter you type on the keyboard is spoken aloud as well. You can also use Predictive Text, which suggests word options that you can listen to and choose from to get help with spelling. Guided Access helps people with autism and/or other attention and sensory challenges stay focused on the task (or app) at hand. With Guided Access, a parent, teacher, or therapist can limit iPad to stay on one app by disabling the Home button and limit the amount of time spent in an app. You can even restrict access to the keyboard or touch input on certain areas of the screen, thereby limiting the amount of possible distractions. Want to know more information about various accessibility features and how to use them on the iPad? 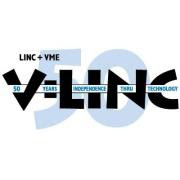 Check out my Thinglink below. In today's classroom, in order to empower students and meet their educational needs, we rely on various instruments, such as, data driven instruction and formative assessments. This can be done through gamified or game based learning and online Web 2.0 tools. There are a number of online formative assessment tools, some which are completely free and others that are free with premium paid features. Some of the popular ones include Kahoot!, Quizlet, and Quizziz. 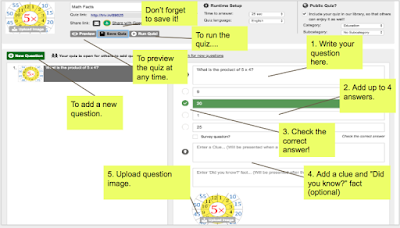 Last week, I stumbled on a free online formative assessment tool called Triventy. Triventy is a game-based learning platform which enables you to author, run, and host quizzes and surveys in your classroom. 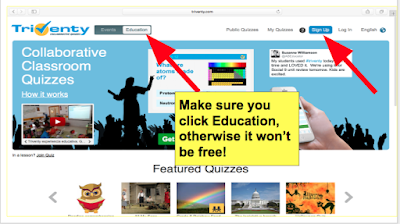 You have the option of creating your own quizzes, customizing public quizzes which have been pre created by other teachers, or running public quizzes "as is." Triventy is easy to use, self-explanatory, and walks you through the online application step by step. Your students will participate in the quiz using their smartphones - without any prior installation - while you run a quiz on a large screen, just like you would run a presentation. You can access Triventy by going to Triventy.com. Although Triventy has been around a few years, it does not seem to be as widely known as other online formative assessments. I found it very easy to use and was quite pleased with the results. 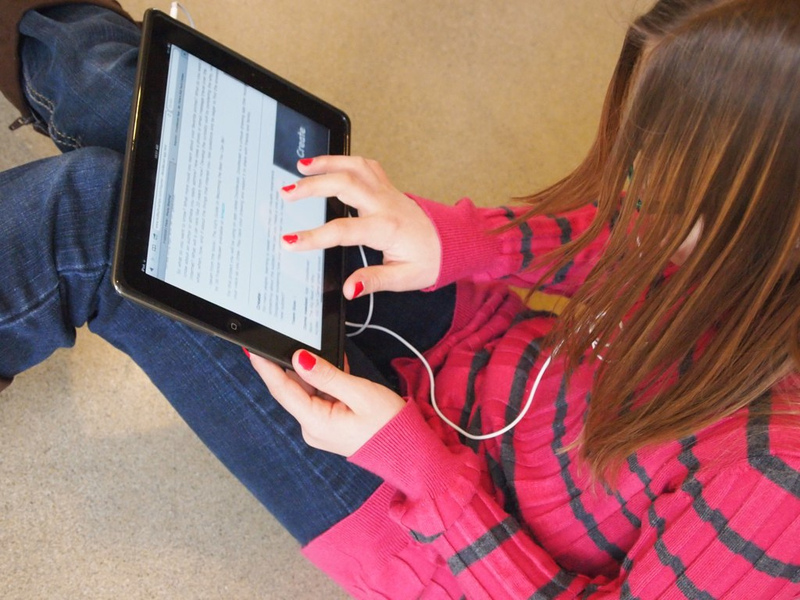 So, how does Triventy compare to other online formative assessments? I've used other formative online assessments such as Kahoot! and Quizziz. Below is a chart comparing and contrasting various online formative assessments compiled by Richard Byrne, well known blogger of Free Technology For Teachers. 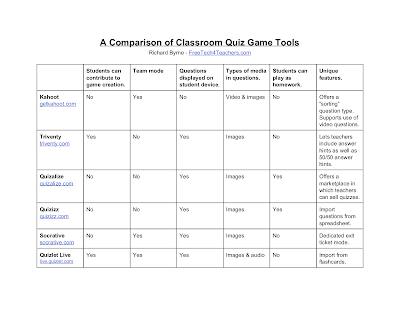 You can download this chart from the following site https://www.freetech4teachers.com/2016/11/six-tools-for-creating-classroom-quiz.html. You can create your own quiz. You can run a public quiz "as-is." You can customize a public quiz to meet the needs of your class. In order to create your own quizzes, you will need to login. 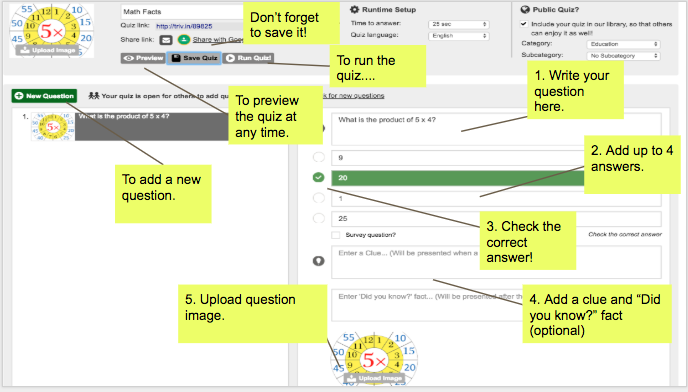 Once you are logged in, go to "My Quizzes" (upper right menu), and click the "Create New Quiz" button located in the upper left hand corner. Once you do that, you will be able to enter the editor mode for your quiz. Follow the directions on the image below in order to create your very own quiz. After you follow the directions above, make sure to save your quiz. 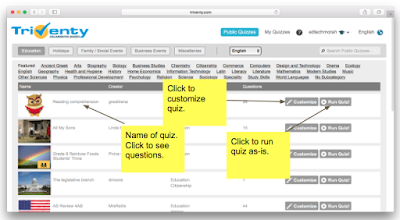 There's also the option of customizing a public quiz to meet the needs of your own students. To customize a public quiz, go to "Public Quizzes." Find the quiz that you would like to use and select the "Customize" button. 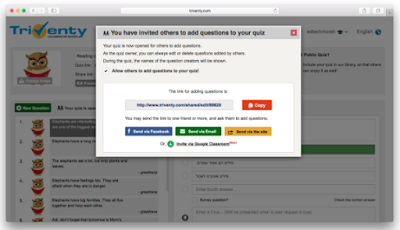 The quiz will be duplicated into your quizzes list where you will be able to edit it from there and make your own. There may be times that you will find a public quiz that will be suitable for your class and therefore, no editing is necessary. As mentioned above, Triventy gives you the ability to allow your students to add questions in your quizzes. When you are in editing mode, click on "Invite others to to add questions to this quiz..." Check the box to share. A popup window will open that provides options as to how you can share it. So now that you've experienced using Triventy, what are the practical applications of this technology tool? What kinds of students could you use it with? When using technology in education, we want to make sure that we use it to enhance, extend, and even redefine our students' learning; we do not want to use technology for the sake of using technology. Using Triventy in a classroom is an easy way to not only assess our students, but to give our students a chance to collaborate with us as well; especially those who might be shy or fearful in expressing their thoughts and opinions in a typical manner. You will be happy that you did and your students will be too! It's a Bird....It's a Plane...It's a Finch Robot at the Maker Xpo! In recent years, there has been much hype around STEM (Science, Technology, Engineering, Math); hence the creation of "STEM classes" and "Maker Spaces." Too often, something that first starts off as innovative unfortunately has the potential to become a fad, because all of a sudden, anyone and everyone is participating in it. Because of this, it's very easy to lose sight of the "big picture" and forget WHY we adopted the initiative to begin with. Therefore, it's always important to set goals for what skills are to be accomplished through this task. Our SINAI Schools students had the pleasure of participating in this year's Maker XPO for the purpose of inclusion and was the only Special Needs school participating. 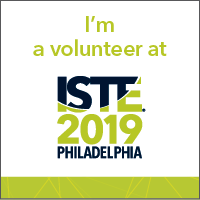 When choosing an idea for a booth, I also wanted to make sure that it would provide them an experience through which they could strengthen their critical thinking skills as well as the opportunity to be immersed in an experience with STEM that would be relevant to them. One of the key elements when teaching a STEM curriculum is making it relevant, concrete, and multi-sensory. This is even more important when presenting such concepts to students with special needs. Too often, people who are unfamiliar with students who have special needs believe that they either can't be taught, or they need to be spoon-fed the information as they are not able to learn the material themselves. How wrong they are. If the material is presented in a clear, relevant, concrete, multi-sensory, and exciting way, there's no reason at all that these students cannot reach their full potential. When it came to selecting a booth for this year's Maker XPO, it was important for me to choose an activity that exhibited the qualities mentioned above as well as being one which my students would be able to teach themselves; I wanted them to have a sense of empowerment and be in control of their own learning. When one teaches him or herself the content, there is a greater sense of appreciation afterward because he or she knows the amount of effort and dedication that goes into learning the content. GIVE a man a fish and you feed him for a day. TEACH him how to fish and you feed him for his lifetime. — Italian proverb. The choice for an activity was crystal clear. I decided to contact Birdbrain Technologies and ask if we could borrow their Finch Robots. So what are the Finch Robots you may ask? And why would it be something so intriguing for our students? As I mentioned beforehand, teaching a STEM curriculum can be very dry and abstract; it's all about the presentation. The content and skills need to be presented in a clear, direct, concrete, and relevant manner. In addition, many students with special needs have a hard time with flexibility; rather they are rigid and need to be in control of their own of their own learning environment. 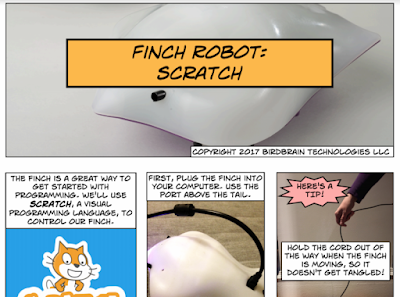 Using the Finch Robots to teach computer science programming accomplishes those tasks providing the user full control of his or her learning environment, an opportunity to strengthen higher order thinking skills, and last but not least, a multi-sensory learning experience. It's a win-win situation for everyone. So, how does it work you ask? Finch Robots can be programmed through the languages of Scratch or Snap which are both very visually based and user-friendly. For purposes of this project, I chose to use Snap. 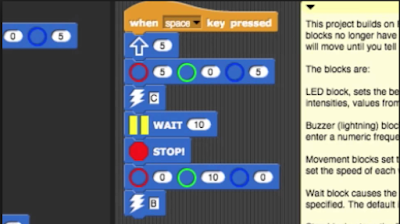 When the Finch robot is connected via USB to the computer, the students use Snap to build a program or "script" by dragging and dropping blocks together. There are a variety of commands that one can choose from, including but not limited to: controls, motions, looks, and sounds. These controls enable the user full control of the program thereby making it very user-friendly. While the students were at the Maker XPO, they were able to apply the skills that they learned and teach the program to participants with full confidence. Mrs. Smith* and her daughters expressed how pleased they were that they came and saw Miriam* at the XPO today. She sent the following email: "Just want to reiterate how rewarding it was for Miriam to participate in the XPO today. We too enjoyed seeing her in action. " Mrs. Klein* texted about Sarah: "She had an amazing time, what an experience for her!!! Thank you!" Sima Kelner, Director of SINAI @Maaynot Yeshiva High School for Girls expressed her enthusiasm as well, "The girls felt such pride, as did I, watching them lead, explain and educate. The project you picked was on target and you prepared the girls so well for their role both by teaching them how it worked as well as role-playing how to interact with those who came to the table. Karen* told me she wished we could have stayed longer!" This is a testament that every child wants to learn and every child can learn. Given the right materials, environment, experience, and presentation, every child will be able to learn successfully thereby being able to reach his or her potential. How will you ensure that your students reach their potential the next time you present them with material that could otherwise be dry and abstract? What will you do to ensure that it's presented in an exciting and relevant manner so that they will connect with it? That's definitely something to think about. I'm sure you've heard the saying, "Teachers are the worst audience." If you have a bunch of teachers in the audience and you find that they are chatting away, it's most likely because they are not finding the speaker or activity very entertaining or relevant to their professional learning and growth. The same thing applies to our students. If our students do not find the learning to be relevant, they're not going to enjoy learning either. But what about when the professional learning is custom designed to meet their needs? 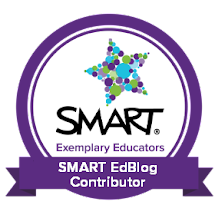 And that's what the SMART Technologies Global SEE (SMART Exemplary Educator) Summit 2016 was all about. After a hard year's work of teaching - and everything else that we do in the field of education, teachers need time to recharge. It's important to receive professional learning in a way that not just enables us, but encourages us, to collaborate with others in our field. Sometimes, those of us who work in the field of Educational Technology feel alone or isolated, as if others do not understand what we do or why we do it (which is an entirely separate discussion). And as much as I love the use of technology, it's never going to replace face to face learning in terms of social interaction. 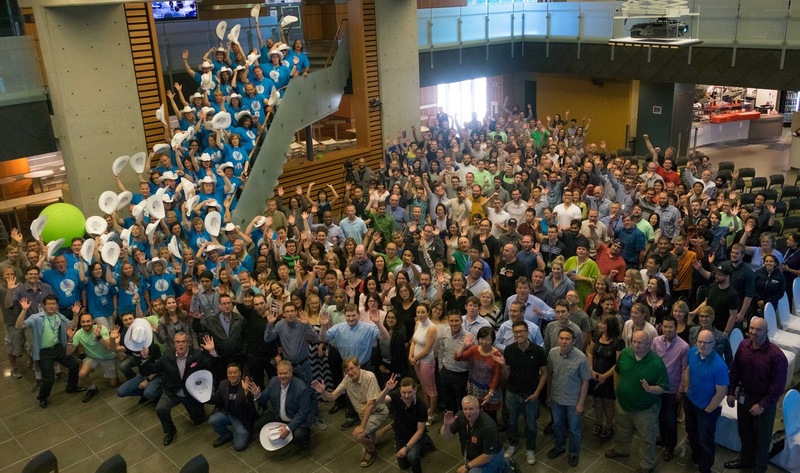 It's for this reason that SMART brought 57 educators from around the globe to its headquarters in Calgary, Alberta, Canada. So what did we do during the five days that we were there? The theme was "Teachers are Superheroes." This is something that we educators know in the back of our minds, right? Yet, it's important that others acknowledge this as well. In addition, it's nice to feel appreciated. Therefore, many of the activities revolved around the theme; from the superhero dinner, the decorations, icebreakers, and more. Of course, this was just the beginning. Throughout the school year, I am often in contact with developers of various software at different companies, including SMART Technologies. I appreciate the fact that these developers value what we educators have to say. It's great actually being able to visit them in Calgary at HQ and meet them face to face. The entire SMART family - the Executives, developers, engineers, and everyone else in between, was as welcoming as could be. They truly value our input and put education at the top of their list. And then there's the "Hackathon"...... (For those of you who don't know what a Hackathon is, click here.) Imagine that you are given the opportunity to be innovative, creative, and/or transform something from better to the best. That's what the Hackathon at SMART is all about. Currently in its third year, we SEEs have a chance to sit and collaborate with SMART developers and engineers. It could be a piece of hardware or software that we are looking to develop. Or, it could be taking something that is already in existence and transforming it to be even a better product. It's the chance to say that ANYTHING and EVERYTHING is possible. This is probably my favorite part of summit. So this year, we developed a... Oops! I can't tell you that - sorry! I have to mention the Superhero dinner too at the Calgary Zoo. I don't think I've ever seen so many superheroes together at once in all of my life! So many superheroes including but not limited to: Wonder Woman, Batman, Superman, and let's not forget Minnie Mouse, Pippi Longstocking and Santa Claus! The spirit in the air was contagious! It was also refreshing to take some time to learn offsite at Calgary's beautiful Heritage Park. We spent part of the afternoon on a scavenger hunt learning about what life in the 1800's was like in western Canada. Some of us took a boat ride on the S.S. Moyie while others went on a horse and buggy ride. Just be sure to watch out where you step! We were told time and time again, that we are the "Best of the Best of the Best," but I can honestly say that we educators only become great superheroes when we have sidekicks and superpowers that support our daily challenges in education. We could not have done it without you, SMART. So thanks for helping us defeat our challenges and make what seems impossible, possible.